I studied Arabic for more than five years (3 1/2 years of Modern Standard Arabic as an undergrad and 2 years of Classical Arabic as a Masters student) and fell in love with the language. Arabic is extremely well-organized and the script is beautiful to write. 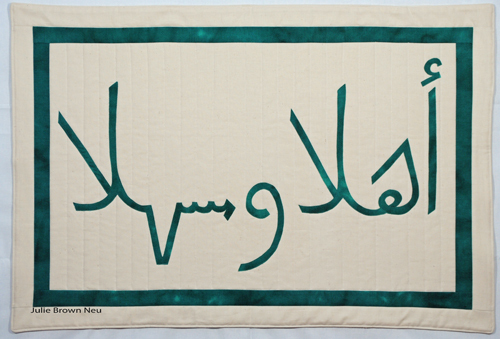 Ahlan wa Sahlan has always been one of my favorite phrases because of its meaning but also because it’s a lovely design. There are two equally sized words ending in the same letters, connected by a rounded letter meaning “and” with an upturned H in the first word balanced by a dipping H in the second. But today, we are turning away the “homeless, tempest-tost” refugees because many are Muslim. The President has attempted to ban people from seven Muslim-majority countries, claiming national security, but terrorists have not come from those countries, and as Timothy McVeigh brings to mind, terrorists don’t have to be Muslim. The wave of “America First” nationalism that is coursing through the country concerns me because it does not represent the welcoming “land of freedom” that I believe us to be and that I expect us to be. Ultimately, I think that open arms and an open door will do more to counter terrorism than anything else and that’s why I’ve put out the welcome mat.